A bill in the U.S. Senate would change how marijuana is treated at the federal level. Here's what that would mean for Washington state, where medicinal and legal use of cannabis are already legal. A bipartisan trio of U.S. senators on Tuesday introduced the CARERS Act, a bill that overhauls how the federal government treats marijuana. Sens. 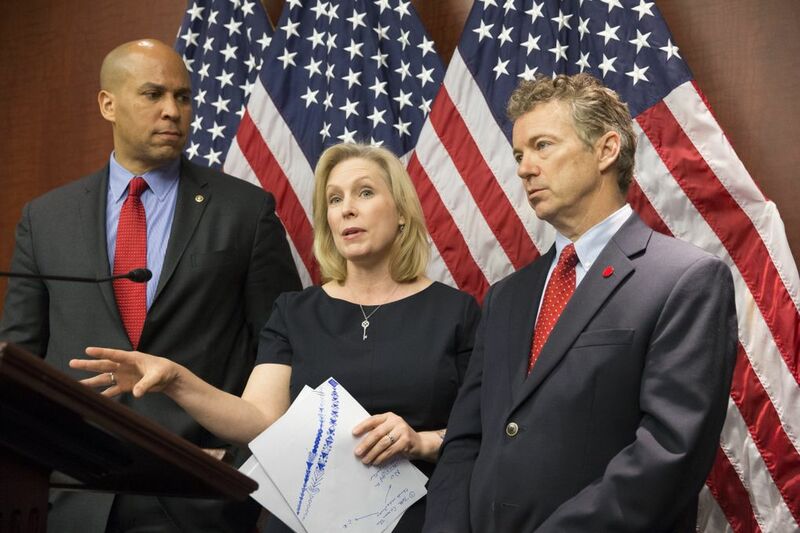 Kirsten Gillibrand (D-N.Y.), Rand Paul (R-Kentucky) and Cory Booker (D-New Jersey) outlined the bill in a press conference. Downgrade cannabis from a Schedule 1 substance to Schedule 2, which allows doctors to prescribe it. Remove low-THC, high-CBD marijuana from the schedule altogether. Remove federal penalties for production, possession and distribution of medical marijuana when state laws are followed. Allow doctors at the Department of Veterans Affairs to prescribe marijuana to veterans. Prevent banks from rejecting marijuana businesses. What does this mean for Washington? Marijuana has been legal in Washington for recreational purposes since 2012 and since 1998 for medical purposes. The state has been regulating the production, distribution and sale of recreational marijuana since last summer. Marijuana remains illegal at the federal level, but enforcement is not a priority — for now. Marijuana has flourished during President Obama’s term because of prosecutorial discretion at the federal level. Twice, the Justice Department has indicated it would allow states to experiment with new marijuana regulations that don’t align with federal laws. In 2009, the Justice Department issued a nonbinding guidance memo that discouraged prosecution of medical-marijuana operations that follow state laws. In 2012, when Washington and Colorado passed initiatives legalizing marijuana, the states did not have assurances that the federal government would allow them to proceed. Washington Gov. Jay Inslee even sent a letter promising the federal government that Washington would be mindful and careful in creating a pot system. Months later, the feds sent out a second memo that said they would not interfere with Colorado and Washington’s legalization policies if the states were attentive to guidelines from the Justice Department. Still, the Justice Department reserved the ability to step in at any point or change its mind. Simply put, the feds reserve the right to shut things down whenever they want. In theory, the Drug Enforcement Administration (DEA) could raid legal, recreational stores under federal law. The legalization of medical marijuana would provide concrete protection for the state’s medical-marijuana program. Holder has allowed marijuana to flourish, but it’s not clear, if appointed, how Lynch would handle the issues. This legislation would prevent a legal challenge to states’ marijuana regulation. Moreover, the 2016 presidential candidates are all over the map on marijuana. A new administration could roll back states’ marijuana-regulation implementations. Like Bush, Marco Rubio opposed his state’s medical-marijuana initiative. Hillary Clinton seems to be still forming her opinion. According to CNN, she called marijuana a “gateway drug” and said she wants to “wait and see” what happens with legalization at the state level. Marijuana advocates have long been frustrated with marijuana’s Schedule 1 designation. Cocaine, methamphetamine and methadone are all Schedule 2 drugs, meaning they are classified as having “less abuse potential” than marijuana, according to the DEA. The bill would move marijuana to a Schedule 2 drug, acknowledging that it has some medical benefit and cut down some red tape around actually acquiring marijuana for research. Right now, the National Institute on Drug Abuse (NIDA) and the DEA have a monopoly on marijuana supply for legal, federally funded research. Marijuana advocates argue the DEA impedes and obstructs research on marijuana. This bill would reform the NIDA and allow more research on marijuana. As a biotech state with progressive marijuana policies, Washington could be the beneficiary of research funding. The state Senate recently passed a bill that would bolster cannabis research in Washington. Washington could have a head start if universities were comfortable seeking federal funding for cannabis research. Paul said the bill would give marijuana businesses access to traditional banking services. A few credit unions have provided limited services to the marijuana industry, but some business owners have paid their taxes in cash, which they say is a security risk. In fact, the Washington Liquor Control Board had to retrofit its agency headquarters and build a secure cash room to protect its cash haul. The new legislation would allow doctors providing care through the Veterans Health Administration to authorize marijuana for patients. According to the Department of Veterans Affairs, more than 600,000 veterans live in Washington state.